Wow, nice work! These look lovely. I love the orangeyness, not too orange, but bright enough to be cheery. ooh! i have always thought that thai tea would be a glorious flavor for a bite sized delight. bravo for your stellar work in the field of cupcakery! They looked great! I hope this will be the successful (and delicious) end to your search for your perfect Thai tea cupcake. Oh I like the idea of the flavouring in the frosting. I also like the little surprise cone you created. Thank goodness these are just cupcakes though, I’ll have to freeze the rest so that I won’t eat them all at once. This tasted Great. I just took the last one off tray. I am not a tea fan and I loved it. I always love coming to your site. You are such an inspiration for me to try new things. Is the ‘cake’ part of this ensemble a vanilla cupcake? 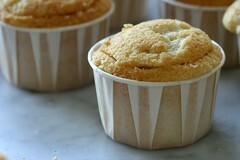 I am trying to come up with a perfect vanilla cupcake. 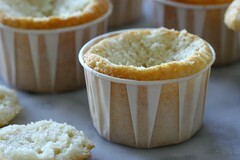 I have tried a few recipes from the Cake Bible (my favorite) and wondered if you have a favorite vanilla recipe? I had the most delicious earl grey ice cream over the weekend in New Orleans. It was a compliment to a little chocolate cake, paired with earl- grey-soaked cherries, but the cake took a back seat to the ice cream. If you’re going down the road of tea-inspired cupcakes, I’d bet an earl grey creme would be delicious – and maybe incorporate cherries? OMG. I love the last photo with the cupcake and thai tea. It’s precious! sorry for the lack of responses, but i have been busy getting ready to go on vacation. 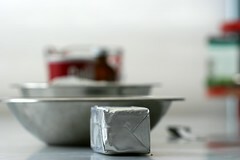 i shall be gone for 2 weeks, but will be working on a new recipe where i am going. Hmmmm! the filling just look like perfect! It’s a really nice secret if you don’t tell your guests before they bite ;-) Thank you very much for these great ideas! Love the way you put the filling in! I would never have thought of that. I always use a pastry bag with an extra long needle point tip but it doesn’t really always work as well as simply cutting off the top and replacing it would because you can’t always get enough filling squeezed in to make it worth it without blowing out the side of the cupcake. I loved your idea. Simple and perfect. They’re beautiful! Great job! Hi! I love your site, and wanted to let you know that I used your Ice Cream Cone Cupcake recipe to make World Cup Cakes (http://yumbrosia.com/2006/07/01/world-cup-cakes) They worked out great and were delicious. Thanks so much! oooh! i can’t wait to try these! the other batch i made was good but these look divine!!! you are one inspiring cupcake master! i bow to you! I have a favorite cake which I always make for christmas or my birthday and I would love to see how you ‘cupcake’ it. It is adapted from one I tasted from the ‘Guilt Tripp’ bakery in Jamaica. It consists of chocolate genoise, sliced poached pears, coffee flavored french buttercream (not too sweet)and ginger cream (I use whipping cream, chrystalized ginger and Thai instant ginger tea), in delectable layers. Yummm! What a wonderful creation! I love your posts. Beautiful. these look yummy! have you ever tried making a chocolate earl grey cupcake? It has almost been a month! Where are you Chockylit? We miss you! I know! I just got back from vacation. in Portugal. 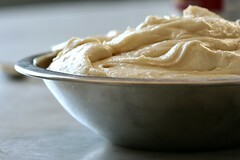 I am working on a Portugal inspire recipe this weekend and will post on Sunday! I have been admiring your cupcakes for a long time and I’m delighted to see your persistance on making the perfect thai tea cupcake. A big fan of the drink myself, I looked high and low for some thai tea mix that tastes almost exact to the stuff I was getting at my favourite restaurants. Years later, a friend told me that the actual thai tea is made simply from this: very strongly brewed red/rooibos tea (a tea made from a plant in Africa; surprisingly it can be found in most grocery stores) with a splash of coffee creamer and ice. I highly recommend you try the tea. This is most likely the taste you’re looking for! Oh migosh that frosting looks amazingly decadent. I’m drooling. Is there a way to make my own tea syrup? 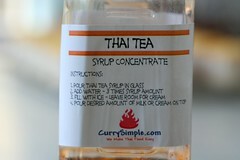 I was going to try this recipe and could not find the Thai Tea syrup in my local Thai grocery store. I purchased a powdered version instead which I will need to add sugar to. Can I just use the base version of this mix (without the cream) in place of the syrup? 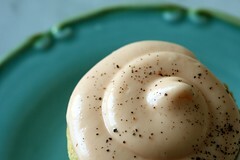 i just made a thai tea cupcake that i was more than pleased with and will soon be selling through my bakery! i figured the only way to get a really solid thai tea taste in the cake without too much of a saccharine taste was to use really strongly brewed thai tea in the batter. i made a white cake so as not to overpower the tea and with the strong thai tea? amazing! Hi Cheryl. Love your blog (& cupcakes)! I lived in SF for 17 years before moving to London, and the one thing I really miss is Thai Iced tea. Thai restaurants here don’t seem to serve it (no one i know here has even heard of it!) 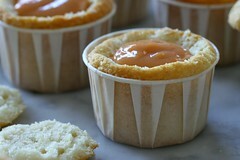 I was perusing your blog the other day & saw your posts on Thai Tea cupcakes & thought it was a brilliant idea! Inspired by you & an intense craving for the stuff, I tried to make eggless Thai tea-esque fairy cakes yesterday, and it worked! My 2 little boys & hub loved them (mind you, they have no idea what thai tea tastes like). I brewed 5 teabags of red tea in 120ml of water & mixed in 85g of leftover dulce de leche. I iced the cakes with leftover dulce de leche marshmallow buttercream. The taste & color was close enough to how I remember the tea & took me right back to Bangkok Garden in DC. Thanks for the inspiration & sharing your recipes! Awesome story! No Thai iced tea? What a shame! This is a pretty old post, so I’m sure you’re no longer following it…but I just wanted to point out that your recipe & photo is on the CurrySimple website. You probably allowed this, but they gave you no credit…not sure if that’s normal. Just an FYI. 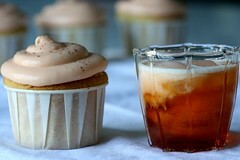 Has anyone made the other thai tea cupcake http://cupcakeblog.com/?p=8 with strong brewed tea instead of instant, then soaked it in the milk mixture like you would for a tres leches cupcake? ?